Топовые версии компактного спорткара пережили плановое обновление, которое затронуло исключительно внешность и интерьер Audi TT RS. В июле 2018 года Audi показала обновление спорткара TT. Тогда речь шла о базовых купе и родстере. Позднее рестайлинг коснулся "подогретого" исполнения TT S и только сейчас обновились "горячие" TT RS. Увы, изменения носят косметический характер. Audi заявляет, что полностью переработала переднюю часть кузова, но из самых очевидных нововведений — передний бампер с более массивными, чем прежде, воздухозаборниками. За решёткой радиатора скрыты дополнительные радиаторы, улучшающие охлаждение. Также переработан передний сплиттер, который может быть окрашен в цвет кузова или выполнен в глянцево-чёрном варианте или под алюминий. Сзади изменилось антикрыло, получившее боковые элементы, а фонари связала небольшая полоска. В базовую комплектацию TT RS входят светодиодные фары, а за доплату можно выбрать матричную оптику и задние фонари на органических светодиодах. Для спорткара доступны 8 цветов, включая эксклюзивный Kyalami Green, Pulse Orange и Turbo Blue, которые можно дополнить матовым алюминием или глянцево-чёрным декором кузова. Двигатель остался неизменным. TT RS Coupe и Roadster оснащаются 5-цилиндровым 2,5-литровым бензиновым турбомотором TFSI мощностью 400 л.с. Агрегат, который стал 9-кратным победителем конкурса International Engine of the Year, позволяет спорткару разгоняться 0-100 км/ч за 3,7 секунды и развивать 250 или 280 км/ч максимальной скорости. В базовой версии все TT RS оснащаются 7-ступенчатой роботизированной коробкой передач S tronic и полным приводом quattro. Покупатель может выбрать 19- или 20-дюймовые колёса, чёрные или красные тормозные суппорта. За доплату спортивную подвеску можно дополнить адаптивными амортизаторами. Интерьер изменился несущественно. Обновлено программное обеспечение мультимедийной системы и 12,3-дюймовой цифровой панели приборов. Кроме того, для спорткара можно заказать два дизайнерских пакета с синими или красными деталями в салоне, а для спортивных кресел можно заказать отделку алькантарой или кожей. В Европе приём заказов на обновлённый Audi TT RS Coupe и Roadster начнётся с 7 февраля. Audi Sport hones the top model of the TT model series: With an even more dynamic look, the new TT RS (combined fuel consumption l/100 km: 8,1 – 7,9 [29.0 – 29.8 US mpg]; combined CO2 emissions in g/km: 183 – 181 [294.5 – 291.3 g/mi]*) showcases with confidence what it has to offer. Its five-cylinder engine delivers 400 metric horsepower, accompanied by the unmistakable five-cylinder sound. The new TT RS will be available to order beginning on February 7th, 2019. The Coupé and Roadster will be found at dealers in Germany and other European countries from spring of 2019 on. Prices for the Coupé start at EUR 67,700. The Roadster starts at EUR 70,500. The TT RS has never been this masculine. The completely redrawn front end and the striking rear end give it a dynamic appearance. The quattro logo in a matt titanium-look is positioned in the lower section of the gloss black grill with its matt black Singleframe. The lateral air inlets, which have been enlarged once again, are each divided by vertical strips on the inside and outside. For cooling purposes there are additional radiators located behind the typical RS honeycomb grill. The lateral air inlets that extend almost all the way to the front wheel wells make the new TT RS appear extremely wide. A continuous front spoiler that is drawn up steeply at the lateral ends pulls the front apron down sharply, giving the car its distinctive, motorsport-inspired look. The blade is painted in body color as standard, but is also available in a matt aluminum look or gloss black. The RS model has a gloss black inlay in the newly designed side sill. The exterior mirror housings are available in body color, matt aluminum look, gloss black, and carbon. At the rear, it is the newly designed fixed rear wing with side winglets that catches the eye. As part of the aerodynamics concept, it supports RS-typical performance and efficiency. There are vertical design elements on both sides above the new RS-specific diffusor. Two large oval exhaust tailpipes create the typical RS finish. LED headlights are standard. The optional matrix LED units regulate the high beams intelligently and with great flexibility. The optional matrix OLED reversing lights (organic light emitting diode) with a 3D design distribute their extensive light with extreme homogeneity and precision. When the ignition is switched on, the OLED reversing lights put on a spectacular display. In the interior, there is a new red 12 o’clock marking on the steering wheel rim. The new TT RS is available in eight different colors, including the new RS-specific color Kyalami green and the new colors Pulse orange and Turbo blue. Upon request, matt aluminum and gloss black styling packages highlight the blade and rear wing. The gloss black styling package includes the Audi rings and the TT RS model logo in black on the front and rear as an option. The fabric top of the TT RS Roadster is black. The Audi exclusive program offers various additional possibilities for individualization. Five-cylinder, 294 kW (400 metric horsepower) output, 480 Nm (354.0 lb-ft) of torque, quattro all-wheel drive—the Audi TT RS impresses with inner values and offers an outstanding driving performance. 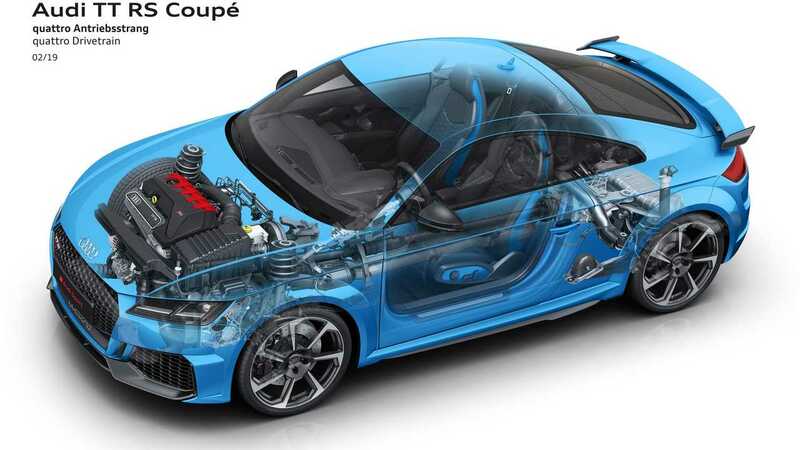 The Coupé sprints from 0 to 100 km/h (0 to 62.1 mph) in only 3.7 seconds. Musical accompaniment is provided by the typical five-cylinder sound: 1-2-4-5-3. Due to this ignition sequence, ignition alternates between adjacent cylinders and those far apart from one another. This unique rhythm is music to the ears of many horsepower purists. Last year, Audi Sport received the sought-after “International Engine of the Year Award” for the 2.5 TFSI engine for the ninth consecutive time. The turbo engine draws its power from an engine displacement of 2,480 cm3. The engine’s maximum torque of 480 Nm (354.0 lb-ft) is available between 1,950 and 5,850 rpm. The top speed is regulated at 250 km/h (155.3 mph) or an optional 280 km/h (174.0 mph). The forces of the five-cylinder engine flow via a seven-speed S tronic to the quattro permanent all-wheel drive that distributes the power as needed between the axles via a multi-plate clutch. Wheel-selective torque control makes handling even more agile and safe. The driver can use the Audi drive select dynamic handling system to influence the quattro drive and other components such as the steering, S tronic, engine characteristic, and exhaust flaps. The four modes available for this are comfort, auto, dynamic, and individual. 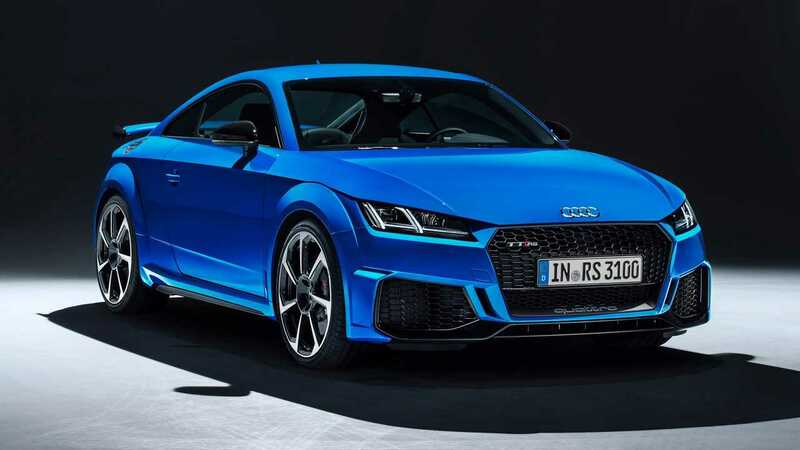 The low weight (1,450 kg (3,196.7 lb), TT RS Coupé without driver) and the consistently sporty suspension provide the basic prerequisites for the excellent handling of the Audi TT RS. The progressive steering adapted specifically to the RS ensures close contact with the road. At the front axle, ventilated and perforated steel discs are in action behind the 19-inch or 20-inch wheels. The brake calipers are painted black as standard, but are available in red as an option. As an option, the RS sport suspension plus is available with adaptive dampers in Audi magnetic ride technology. Their control technology is also integrated into the Audi drive select dynamic handling system. Controls and display in the new TT RS are focused completely on the driver. The RS sport seats with the rhombus pattern in Alcantara or optionally with a honeycomb pattern in fine Nappa leather as well as the RS logos on the seats, steering wheel, door sill trims, and selector levers underline the sporty character of the 2+2 seater. Special RS displays in the standard Audi virtual cockpit with a 12.3-inch screen provide information on tire pressure, torque, and g-forces. In manual mode, the shift light display prompts the driver to upshift when the maximum engine speed is reached. In addition to multifunction buttons, the RS sport leather steering wheel with shift paddles features two satellite controls for turning the engine on and off as well as the Audi drive select dynamic handling system. The new RS design package adds red or blue highlights to the car on the air vent doors, the seat belts, and the floor mats with the RS logo. The extended RS design package also offers contrasting design elements on the seats and center console. Audi also offers a great deal of infotainment features. The options include MMI navigation plus with MMI touch including free text search and natural language voice control, as well as the Wi-Fi hotspot and the Audi connect online module. Online services reach the vehicle via the fast LTE standard. The Audi smartphone interface connects smartphones with the TT RS and can stream content seamlessly to the Audi virtual cockpit via USB. The Bang & Olufsen sound system provides an excellent sound experience on board with an output of 680 watts. The new TT RS will be available to order beginning on February 7th, 2019. The Coupé and Roadster will be at dealerships from spring of 2019 on. The price for the Coupé is EUR 67,700. The Roadster starts at EUR 70,500.